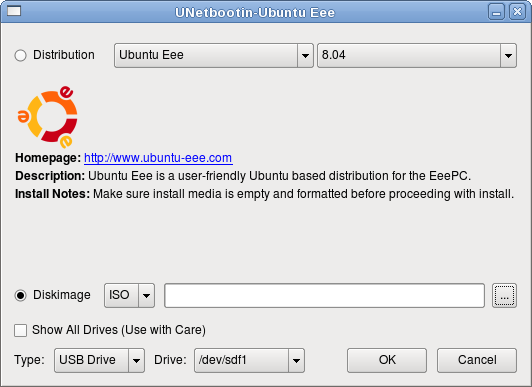 To put Linux on USB stick you need a little program called UNetbootin. That's just the easiest way and the tool is free and cross-platform. This thumbnail at right is a screen-shot of the program. Get UNetbootin for your OS, its about 5 MB so it's small. It's portable, mean that you don't have to install it. If your USB stick has files on it then make a backup or just put them some where else and format the stick. The best part about UNetbootin is that you don't have to download the image file yourself. It downloads selected distribution itself and places it on your USB. If you already have image file then you can use that. Make sure you select right device hit OK and if it's done you can go and install your Ubuntu from USB.